With a 100+ hull you can easily stash thousands of points of harvested water-fuel. Once that is handled the Captain can move on to finding goods (Harvest for Merchant, Explorer for Explorer) and stockpiling them for sale. Harvesting can be a good survival technique and the sales of harvested or discovered resources can sometimes offset the Captain's losses . However, large profits will not be realized until the Captain masters the Spice Hall, Rumor Page and Resource Reports. The Captain that knows he won't sell metal for $500 here because the going price is $5,400 on the next planet over does not cover his expenses -- that Captain gets riiiiiiiiich. (1) It seems that at this difficulty level I am often lose reputation points when I encounter a ship and immediately retreat! That is, if I encounter a merchant vessel of some House and I immediately retreat, I will lose reputation points and my trade permits and/or death warrants for that House. Specifically, immediately upon beginning a game 2 spaces away from my home world, if I encounter one of my faction's ships before I get to the planet then I will have lost reputation points with my home faction before I even complete the contract the game starts me with. Am I getting something wrong? Help! This is intolerable. If I merely bump into my home faction's ships enough, then they turn against me and start attacking me! (2) I read this post with regard to the use of caches. There's 2 things I don't understand about caches. (2A): How can I use caches as a "bank" toward future ship purchases? For instance, if I go to a planet and look at what new ships the shipyard is selling, if I don't buy that ship IMMEDIATELY when offered, it goes away! This would be a good feature to change, actually: I would like to see all of what a shipyard is offering before I have to chose what to buy. In any event, if I leave the planet and go cash in my cache, that new ship offer will not be available when I get back! (2B) When I make a huge EXPLORER find on a planet, is there any way to grab all that stuff? 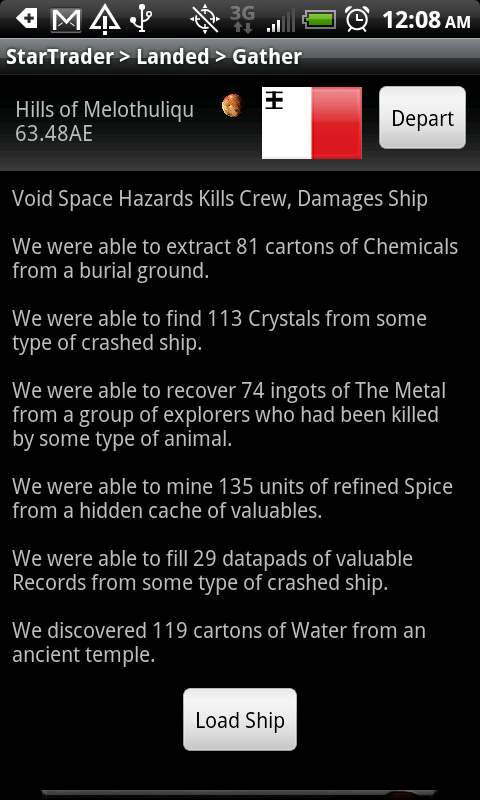 That is, if my ship only has a hold of 40-60, and the find is 150 units of artifacts/other stuff, is there a way to grab some of it, dump it into a cache, and then come back for the rest? WHat if the cache is on the same planet where I made the EXPLORER find? Or is this something we can already do but I haven't figured it out yet? What do you mean by "masters the Spice Hall, Rumor Page and Resource Reports"? Is there a trick to this outside of simply going to these places? You will loose Reputation for running away from Bounty Hunters, Merchants and Warships. You should NOT loose your Trade Permits. There was a bug and I have fixed it for the next release. SORRY!!! Working within a Faction's territory requires the use of Acknowledge and Surrender. Merchants will not respond to surrender and no reputation will be lost. Bounty Hunters and Merchants may search, however, appropriate permits will enable the "Acknowledge" option which always allows the Captain to pass without trouble. Constantly retreating without considering the laws and territory will cause trouble -- but that is the Star Trader's equivalent of running from the police and customs officials! Loss of Permits or other side effects are a mistake and they will stop happening with tomorrow's update. There are problems with this interface and you point out the biggest one. I agree with your suggestions and will implement them promptly. Working now to convert it to a catalog so that you can see all the ships. It will operate like the Ship Upgrade menu. At this time the size of the Ship's Cargo Hold is the balancing factor for the amount of cargo that a Captain can extract from a Stash, a Find or a Harvest. As the Captain's ship increases in size, so will his potential profits. By "masters the Spice Hall, Rumor Page and Resource Reports"? All urban zones have a number of ratings. The Palace and Hall Ratings determine the distance away that a rumor can be detected. Talking to some Traders on a remote Thulun Outpost will get you Fringe rumors. Talking to a Cadar Prince will often get you Syndicate, Core or Military rumors. However, I think if you are playing Elite you will really notice the distance and rumor quality features. Going somewhere good will get you the far away rumors. Get the ones about higher rated planets. Get the ones with high "secrecy" values. I also realized that my post refers to "Spice Trader Rumors" which haven't been turned on yet. Another thing about reputation loss. I recently changed the UI to show the Flag of the Owner of the Sector, instead of the Captain's flag during combat. Reputation loss ONLY occurs when Running from Permit and Death Warrant Ships (Warship, Bounty Hunter, Merchant) who are operating inside there own territory. Is there a skill or ability that will help reduce the crew deaths while exploring on a planet surface? Right now it seems that the death is in many cases is just percent value of the current number of current crew. So if i have 100 or 50 I'll lose half of them regardless of other factors. This causes a loss in time to outfit a new crew and makes bringing a full crew to the planet surface not worth the effort, its just easier to bring less and lose the same percentages. @setona15 the Explorer skill reduces the chance of it happening. I like the idea of reducing the % as well using Tactics or Explorer. A upcoming update will include a slider to allow the Captain to select how many people come with him -- that will help limit the destructive power against the Crew. I am unclear how the profession bountyhunter works. Do I just keep searching for bountyhunter style contracts? How else can I find bounties? By the way I love this game!! Whats with the numbers in ( ) ? When I'm in wilds should I explore /harvest lower numbers when just beginning? Love this game!! Thanks for making it. Hello, I have the elite edition and love the game! However I am curious about the "rumors". Some seem benign like "refugees floodng a local populace" and others more useful like "resource rush on x planet" but what I want to know is the rumors about alien attacks and merchants exploiting a local populace. These are listed as map locations but I am confused as to the usefulness of the rumor. If I investigate the alien attacks, will I encounter aliens? If I investigate the exploitation will I encounter the offending merchants? Or is it just a wild goose chase and I should just keep to the resource hunting rumors? Just want to know. Thanks. That thread has some links to other discussions and might give you some stuff to think about. The most common way to hit Rapid Rank II is with an Explorer of Javat Clan, or perhaps a Cadar Military Officer who takes lots of contracts really fast. @zerohelix - maybe in a future incarnation of the game, but we are currently expanding into other types of game play, including story-driven games with our new game Cyber Knights. Thanks for the feedback! Hey, do you mind if I ask a few questions? There was once when I met an unarmed Zendu Space Hive with some 1000 cargo points. Upon acknowledgement I got stuck in the encounter while the years passed. Can I ask what the Space Hive is about? Space Hives are treasure ships. I do not understand what you mean "stuck in the encounter" but it isn't an issue we have received in the past or ever heard of, so if there was an actual issue, please post details. Space Hives are large, difficult to capture ships with excellent Ghost Crew and high value cargo. I just started playing a few weeks ago, on elite. I noticed that some of the ships use alot less fuel like the Aperio Caliga with sails 21 and engine 8, but when I captured anothership with 21sails and 22engine it used alot more fuel. It seemed to me that it should have had better effeciency with waterfuel or do other factors come into play once both engine and sails are above 20? Stupid question here. I have the non-elite version, and this game seems to only have two difficulty levels: Child's Play and Certain Immediate Death. I'd love to unlock things that I need to be on Challenging and Demanding and whatnot, but I can't seem to survive for more than 10 minutes or so. I'd really love to know if I'm just an idiot who's doing it wrong, and what I can do to do better. @HighAngleEd - try working your way up the difficulty scale. Somewhere just after easy is something more difficult. Star Traders has a really hard difficulty scale. Consider it a ladder and try to climb it. I started on the easiest level and have gotten up to Normal. Those difficulty levels are too easy. Once I cross the line into Challenging, I'm dead in a week. There must be something wrong with my tactics and techniques I guess. @HighAngleEd - yeah, there is likely. You have to make sure you are adapting your play style to classes, difficulties and on the ground changes (rumors, conflicts, reputation) appropriately. Things that worked in Normal (like, maybe ignoring Reputation a bit) will not work in Challenging. Each level forces you to pay attention to more and more pieces of the depth of complexity that is Star Traders. If you are that kind of gamer, you will love it. I'm aggravated over surveillance missions. I'm told to go to a location and gather info, and that I'll get records to indicate mission is complete. I sit and do surveillance over and over until I'm told it's successful and I get records. But I can't figure out how to complete the contract. If I go back and sell the records, it doesn't complete it. It's still listed as an ongoing contract even after I get the records and after I sell them. Going to the palace while in possession of the records doesn't do it. What am I missing? But I am enjoying it immensely. Cutting into time on Eve. Crimso -- you need to get many records ... Keep doing Surveillance until you successfully collect enough records to cause the "Contract Complete" page pops up. The records are your to keep after success. If you sell them mid contract, you have to start over. Amazing game! is there a place to find out the exact stat meanings? Like solar sails vs engine, iknow they both effect gas/water consumption but how do I know what%? Would be cool if one could click the stats to see a somewhat in depth description of them. Also, are there hidden attributes to ships? Some of the starters descriptions don't seem to exactly match the visible stats :) anyways best game on the market _thanks! Idk about hidden attributes, but two of them come with unlisted starting upgrades. Picky Beggar gets the Escape Shuttle. Tempis Fugit starts with a Smuggler's Hold. Got another question I can't seem to find an answer to. I've reached level 50, and it says future retirement unlocked. What do I do with that? I haven't seen anywhere what that means. Hi there, I'm a bit confised as to the ships upgrades. I bought the unlock all pack and it unlocked all the award upgrades, but most planets I go to the upgrades are grayed out. Do some planets only offer some upgrades, and if so what planet offer what upgrades? @frustrated - planets definitely only offer certain upgrades. Bigger planets, bigger shipyards will offer better upgrade lists, but its always changing. Look for rumors about booms at the shipyards for the best. Hi, I am playing the Elite Version and have the ship building package, after designing and paying for a ship no ship supplied. Is this because I am waiting on the ship to be built, been back to the system and the docks a few times but no ship. How does it work?